Vsaka doba prostoru na novo določa uporabnost. Iz šol nastajajo ministrstva, iz vojašnic šole, iz gozdov tovarne, iz tovarn parki, iz parkov parkirišča, iz travnikov cerkve, iz cerkva konjušnice, iz konjušnic stanovanja in iz elektrarn galerije. Urbanizem in arhitektura morata poskrbeti za kvaliteto teh preobrazb. Da obstoječega ne zapravimo, nadomestimo s slabšim. Stavba, ki je izgubila svojo konkretno funkcijo, a je obdržala svoj družbeni pomen in arhitekturno vrednost, si zasluži ohranitev in varovanje. Načini varovanja pa so seveda mnogovrstni. Strategije ukvarjanja z obstoječim v arhitekturnem smislu segajo od strogega varovanja - konzerviranja, rekonstrukcije - do aktivne preobrazbe in nadomestitve z novim. Lahko gre za vključevanje obstoječega v novo, torej za vključevanje npr. arheologije, delov stavb ali pa tudi samo spomina v novo celoto, ali pa gre za vključevanje novega v obstoječe, kot pri prenovah in interpolacijah. Kako povezati neplodno znanje in doktrine varovanja umetnostnih zgodovinarjev in konzervatorjev s plodnim neznanjem kreativcev - arhitektov? Povezati Čopa in Prešerna, Steleta in Plečnika, Carla Scarpo in Licisca Magagnato? Šumija in Mušiča? Kaj pa, če povezava spodleti? Plečnik na Hradčanih, pa tudi v Trgovski zbornici, Križankah, Stranju, Kranju, Gradu in drugod, Bitenc v kompleksu Uršulink, Križaj na Magistratu, pa tudi Ambient na Ljubljanskem gradu, Podrecca v Mariboru in Kobe v Mladiki so nazorni, za varovalce arhitekturne dediščine pa mnogokrat tudi sporni primeri kreativnega dialoga novega z obstoječim. Prepogosto pa kreativni pristop do obstoječega ni mogoč, ker je arhitekt prešibek ali pa je dialog izključen. Rezultat je pocukrana prenova “po spomeniških kriterijih” ali pa pritlična novogradnja s frčadasto streho z bobrovci sredi prestolnega mesta. Pa to še ni vse. Med nenadzorovanim urbanim razvojem periferije in spomeniškim brezprizivnim ščitenjem historičnih oblik, mest in arhitektur se vzpostavlja nekakšno konzervativno in retrospektivno ravnovesje - nostalgično mrtvilo na eni in laissez faire na drugi strani. V tem procesu izgubljata oba, center in periferija. Kvalitetna moderna arhitektura iz polpretekle dobe na obrobju pa tudi v centrih je nemočna žrtev nenačelne koalicije med okorelim spomeniškim varovanjem in turboliberalnim kapitalizmom, na drugi strani pa historična mesta prav zaradi selitve vitalnih vsebin na periferijo, kjer ni omejitev, izhajajočih iz spomeniške zaščite, izgubljajo pomen in se preobražajo v disneyland - v periferijo periferije. Arhitektura je tako v suspenzu na obeh bojiščih. Namesto da bi arhitekti s kreativnim inputom sodobnega “prešpikali” historično tkivo, na periferiji pa izrabili priložnost za nov, tudi drznejši arhitekturni nagovor in eksperiment, se zapiramo v brezizhodno past populističnega vdinjanja logiki danih razmer. V tej številki predstavljamo nekaj uspelih primerov kreativnega dialoga novega s starim, ko je arhitektura na kreativen način odigrala svojo vlogo, hkrati pa tudi objokujemo storjene napake, ko je doživela poraz ali celo eksekucijo. Sprašujemo se po načinih, ki bi prispevali, da bi bilo prvih primerov več, drugih pa manj ali nič. Each period redefines the use of a certain space. Schools are being transformed into ministries, army barracks into schools, forests into factories, factories into parks, parks into car parks, meadows into churches, churches into stables, stables into flats, power plants into galleries. Urbanism and architecture need to take care of the quality of these changes, so that we do not waste that which already exists, or replace it with something worse. A building which has lost its specific function but has kept its social meaning and architectural value, deserves to be preserved and protected. The methods of protection, however, are manifold. In an architectural sense, the strategies for dealing with an existing building span from strict protection – conservation, reconstruction – to active transformation and replacement with the new. This can refer to the incorporation of the existing into the new, i.e. 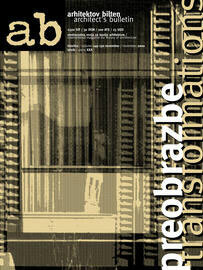 incorporation of archaeology, parts of buildings or even just memory into a new whole. On the other hand we have the incorporation of the new into the existing, as in reconstructions and interpolations. How can we connect the unfertile knowledge and protection doctrines of art historians and conservation experts with the fertile ignorance of creators, i.e. architects? How can we link Čop and Prešeren, Stele and Plečnik, Carlo Scarpa and Licisco Magagnato, Šumi and Mušič? And what if the connection proves to be unsuccessful? Plečnik in Hradčani and the Commercial Chamber, Križanke, Stranje, Kranj, Grad and elsewhere, Bitenc in the complex of Ursuline monastery, Križaj in the Town Hall, Ambient on the Ljubljana Castle, Podrecca in Maribor and Kobe in Mladika, these are all clear examples of creative dialogue between the new and the existing, which the protectors of architectural heritage often find disputable. It often happens that a creative approach towards the existing is not possible because the architect is too weak, or the dialogue is simply cancelled. The result is sweetened reconstruction “according to the monument protection criteria”, or a new single-storey building with a dormer roof and traditional tiles in the middle of the capital. And this is not all. Between the uncontrolled urban development of suburbia, and irrevocable monument protection of historic forms, towns and architectures, a kind of conservative and retrospective balance is created – nostalgic apathy on one side, and the laissez-faire on the other. In this process, both sides are the losers – the centre and the periphery. Quality modern architecture from our recent past on the periphery as well as in the centre is a helpless victim of the unprincipled coalition between rigid monument protection and turbo-liberal capitalism. On the other hand, historic towns lose their meaning and are turned into Disneylands, the periphery of periphery, precisely because of the moving of vital functions on the outskirts, where there are no limitations imposed by monument protection. Architecture is in suspense on both battle-fields. Architects, instead of “piercing” the historical tissue with creative input, and seizing the opportunity for a new, more daring architectural address and experiment in the periphery, are closing themselves into a dead-end trap of populist servility to the logic of given circumstances. In this issue we are presenting a few successful examples of a creative dialogue between the new and the old, in which architecture played its role creatively, and at the same time mourning over the mistakes made, where architecture was defeated or even executed. We are asking ourselves about methods that would contribute to the rising number of examples of the former, and little or none of the latter.